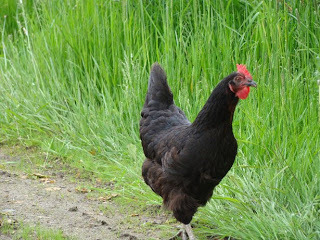 Since early summer, my girls and I had anticipated visiting a local farm that sells free-range chickens; grass-fed, hormone and antibiotic-free beef and pork; and farm-fresh eggs and milk. (Understand, though, that when I say “local” I mean a one-way trip of over an hour.) Seeking better quality meats is another step in our journey toward healthier eating. One afternoon last week we set out on our adventure to the country. As we drove down the lane to the farm, it was quite interesting to wonder if one of the chickens strutting through an adjacent field would be a future meal. When she saw how curious my seven-year-old was, she took us out to see baby chicks and young turkeys, then led us back to a fence that held what had to be the hugest hog I have ever seen! I will admit that this experience confirmed that farm living is NOT the life for me. Between the flies, the smells and the manual labor, I’ll gratefully maintain my place on this side of the food cycle. It does, however, give you an appreciation for all that goes into farming. Shaking hands with the person who is providing your meat is a different experience from picking up a package of meat in the grocery store. While finances don’t allow me to buy all of my meat this way, I hope to at least make occasional bulk purchases. I was delighted to learn that the farm delivers food weekly to a farmer’s market – that’s only twenty minutes from our house. To prolong my feeling of making healthier food choices and stimulating the local economy, I stopped to buy produce at a roadside stand on the way home – and even resisted the urge to stop for ice cream at McDonald’s! But don’t put me on a pedestal just yet; my kids’ snack yesterday was chocolate chip cookies – courtesy of refrigerated Nestle cookie dough! Do you have a tip for helping your family eat healthier? This post is linked to Try New Adventures Thursday at Alicia’s Homemaking. What an educational trip!! I bet the girls will not soon forget it! Way to go to make it educational and practical! I recently discovered that when I have less snacks in the house ~ my kids eat almost all of their meals at mealtime!! (Less picky eaters when they don't have thing to munch on inbetween!!) I'm trying to be disciplined in making sure they get their veggies and fiber ~ two things they have been quite picky on….trying new strategies and recipes daily! Have a wonderful trip Tracey ~ will be praying! I'm sure you'll be a very needed blessing to your folks!! What a great trip! I took my girls to my friends farm a few weeks ago and they loved all the animals. They even milked a cow. I think healthy eating is sometimes so difficult especially when things get so busy. In the summer I have bought a lot of fresh fruit and leave it out where it is accessible. My girls love that! Tracey, this really made me smile (esp. when you were wondering about the chicken being a future meal!). It also reminds me that I have been meaning to look for a local dairy farm in my new town and haven't gotten to it yet. I have mixed feelings have living on a farm. I think in the future, I'll start with chickens and we'll go from there. I'm pretty sure I'm NOT down with owning a hog. Haha!